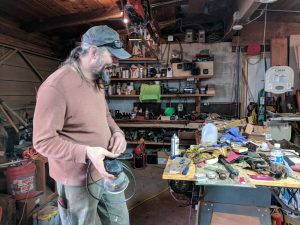 Note: The next Tokeland North Cove Art and Studio Tour is May 4, 2019, and Woodfest will be July 27-28, 2019. Updates to come. At the northern tip of Pacific County sit two small towns with quiet beaches and an easy-going way of life. Tokeland and North Cove are sleepy coastal villages, but they attract a vibrant and eclectic art community. Perhaps it’s the inspiring landscape, perhaps it’s the laid-back vibes. The residents of these coastal communities are inspired to create everything from glass art to chainsaw carvings. This close-knit community of artists opens their studio doors and welcomes visitors to explore the local art scene on April 14. The annual Tokeland North Cove Art and Studio Tour features live demos, an art auction, music, and other antics, like a tattooing contest. Don’t worry. They use oranges for the tattooing competition, and you can join the fun and decorate an orange for $10. Look for the Elements Glass Art cement truck where Michelle Lester tumbles down recycled glass into smooth, beautiful beach glass. Her partner in crime, Jeremy Bartheld, will be sharing his studio space down the road with artists who don’t have studios of their own. 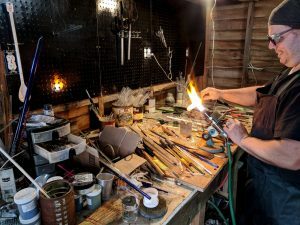 Find his studio behind a wall of colorful, painted doors along Highway 105 and catch a glass blowing demo. Other artists to look for include rock carver Pierre Mollinet, scrap metal sculptor Bob Wahr, wire designer Sharon Gabbard, and wood artist Eric Gabbard just to name a few. Keep an eye on the Tokeland North Cove Art and Studio Tour page for the official map and information on participating artists. Wrap up the day by heading to TradeWinds by the Bay for the box wine tasting and art auction. The auction benefits the Ocosta School Art Program, helping fund field trips and art supplies. Last year, the auction raised enough money to donate to the elementary school as well. Looking for more to do while you’re there? Head down to the beach to spot bald eagles, watch the waves roll in, and enjoy the fresh ocean air. Visit Nelson Crab Inc. seafood market and art gallery for a snack and some coffee with a peaceful view of the Tokeland Marina. You’ll find more pieces by local artists inside along with souvenirs. It’s a great chance to pick up some fresh Willapa Bay oysters, too. If you can’t make it to this event, make plans for Woodfest, July 21-22 for another chance to enjoy work by our incredible local artists.